Hike past oak and mesquite trees on remote nature trails, soar over a winding creek high in the canopy of a forest, and relax in the sun as you savor craft beer and chef-inspired eats on an open-air patio. When you want to spend some time outside, get yourself on over to Plano. 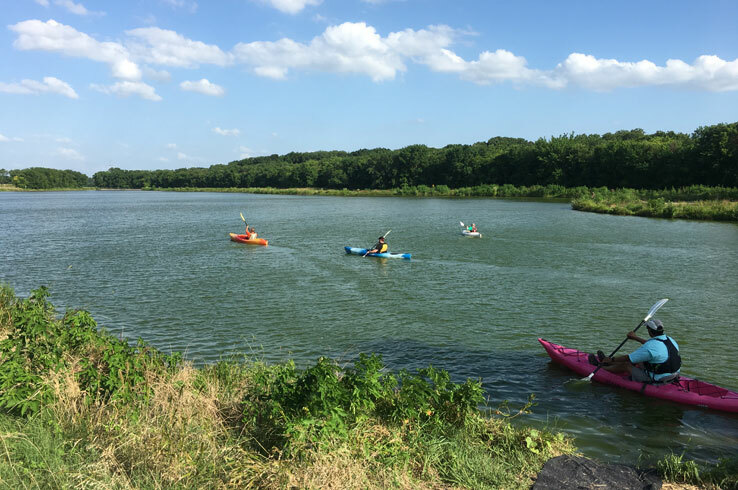 Located just north of Dallas, Plano offers a multitude of ways to enjoy the outdoors. Discover some of the many possibilities below and plan your visit here. Jog along pond-side trails, trek off the beaten path and discover Oak Point Park and Nature Preserve. Situated in the heart of the bustling North Dallas area, this 800-acre retreat is a tranquil getaway from the concrete jungle. Go for a run or a leisurely stroll along the 3.5 miles of paved trails that wind throughout the park or follow the natural-surface pathways that meander through oak thickets and along Rowlett Creek. Want to get out on the water? Bring your own canoe, kayak, or standup paddleboard and paddle away the day (kayak rentals coming soon). You can even try your luck at hooking a catfish here, but you’ll need to make sure you have a fishing license before you cast a line. There are even more trails to traverse at Arbor Hills Nature Preserve. Ride your mountain bike through grasslands and wooded areas as you feel as if you’re away from it all. Don’t leave without a visit to the observation tower, where you’ll take in a picturesque view of Plano. Glide over trickling creeks through the canopy of a forest and test your balance on suspended obstacles throughout an elevated adventure high above terra firma. 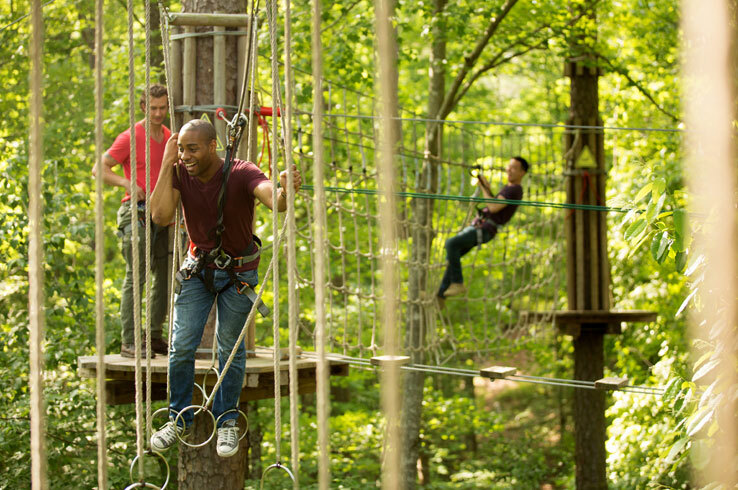 Escape to nature with Go Ape Zip Line & Treetop Adventure in Plano’s Oak Point Park and Nature Preserve. Each step you take on the 2,436-foot course takes you higher in the canopy on a journey that includes five zip lines, two Tarzan swings, and nearly 40 crossings. The tour takes about three hours to complete, and you’ll get plenty of rushes of adrenaline along the way. Just make sure to bring gloves and wear athletic gear and closed-toe sneakers. Sunny spring afternoons and cool summer evenings are what we would call perfect picnic weather, and Plano takes this idea to the next level. Breathe in the fresh air and tuck into some seriously good food at one of the many restaurants with outdoor patios throughout town. Sink your teeth into mouthwatering burger or a fried chicken sandwich embraced by piping hot biscuits at The Biscuit Bar at The Boardwalk at Granite Park. Take your pick, along with a local craft beer or a cocktail, out to the shaded patio and take in the view of a small lake and the cityscape beyond it. The Boardwalk has many other restaurants with patios that are worth a visit, so take your time and bring your appetite. If you’re planning a romantic night out, Mignon Plano is the place to go. Serving such dishes as mint-crusted rack of lamb and filet mignon, this Parisian-style steakhouse charms with its stone-walled patio that overlooks a portion of Lakeside Lake. Mignon Plano resides within Lakeside Market, a sprawling outdoor shopping and dining area with much to browse and taste. 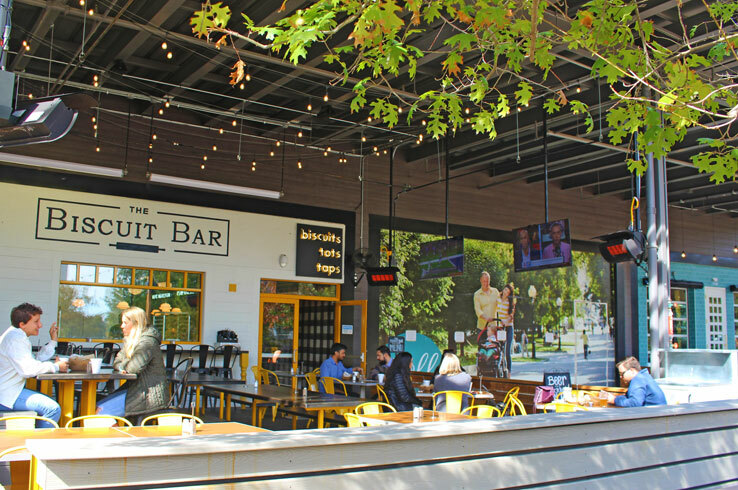 For beer, burgers, brunch, wood-oven pizzas, and more, look no further than Hub Streat Food Port in the Historic Downtown Plano Arts District. No matter what you’re craving, there’s a restaurant with an outdoor patio in Plano that serves it. Get to know some of the options here. Concerts, festivals, movie screenings. Unless it’s raining or snowing, all of these are almost always made even better in nature. 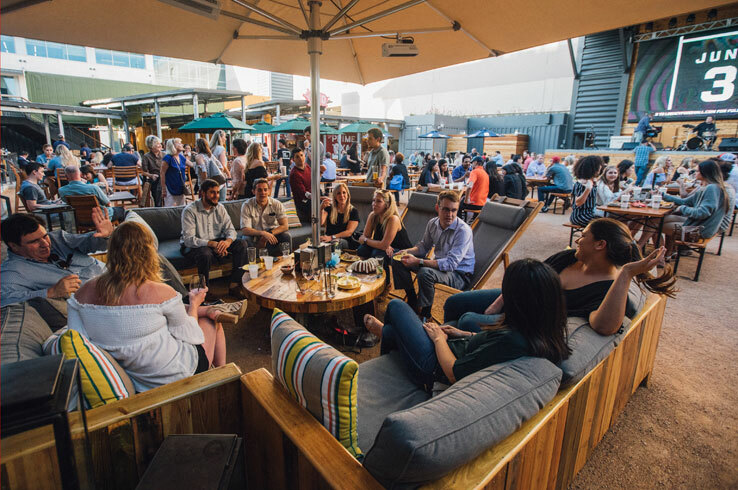 When the weather is ideal, find your way to one of Plano’s three outdoor venues, each with something different to offer. 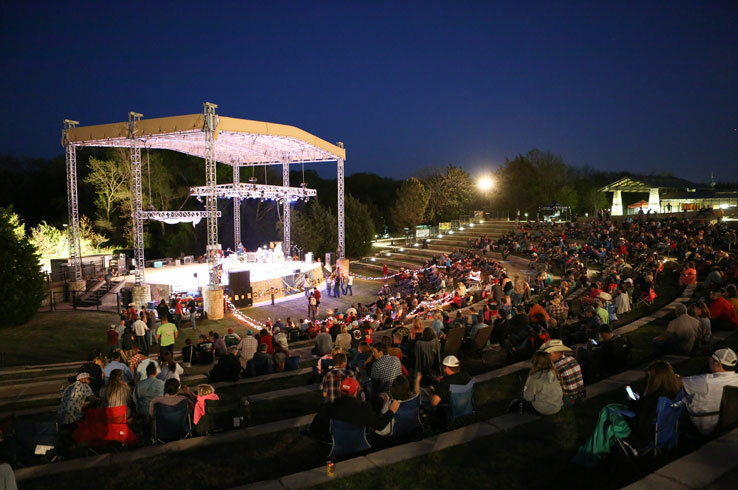 Set down a picnic blanket on one of the terraced rows in front of the Amphitheater at Oak Point Park, home to Beatles Night (early May) and host of family-friendly shows throughout the year. There are even more shows to see at McCall Plaza, an outdoor stage surrounded by the bars and restaurants of downtown Plano. Of course, no mention of Plano’s venues is complete without the Box Garden at Legacy Hall. Reclaimed shipping containers create a modern industrial setting for this 1,500-capacity venue that’s part of a vast dining and drinking destination. Get a pint of craft beer or an entire bottle of wine to share with friends and claim one of the picnic tables for music, drinks, and great company. In a way, window shopping is a lot like urban hiking. If that’s the case, Plano has some of the best around. Tie on your comfy shoes and get ready for a stroll through shopping areas full of high-end retailers. Soak up the sun as you wander around The Shops at Legacy, where high-end boutiques like ella blue and Essensuals London are joined by a variety of eateries that serve everything from Asian and Mediterranean food to pub fare. Not far away, Legacy West is another spot where you should park your car and walk. Such swanky shops as Lululemon and Spence Diamonds line the perfectly walkable Windrose Avenue, with restaurants like Earls Kitchen + Bar and Toulouse are never far away. The vintage storefronts in the Historic Downtown Plano Arts District hold their fair share of surprises as well. Walk along the narrow brick streets and you’ll feel like you’ve been transported back in time, while the clothing, home décor, and furniture shops provide plenty of treasures to uncover. For even more shopping, check out The Shops at Willow Bend. Although it isn’t an outdoor mall, it does have an extensive selection of restaurants and clothing, shoes, toys, jewelry, and other stores that’ll keep you busy. When your appetite hits, find something delicious at The District, Willow Bend’s outdoor restaurant area. If you ask us, there’s nothing better than a pint of beer, a picnic table, and some fresh air. That’s exactly what you’ll get at Plano’s two local craft breweries. Ascend to the top of Legacy Hall and you’ll reach Unlawful Assembly Brewing Company, makers of the award-winning citrus- and hop-forward Blind Justice IPA, as well as refreshing farmhouse ale and a brown ale that tastes of cinnamon, tobacco, vanilla, and caramel. Sip your beer on the patio that overlooks the box garden. Listen to the concerts below as you’re just steps away from the taps, a pretty good place to be in our books. There’s even more delicious beer and basking in the sun to do at Union Bear Brewing Co. Perched along The Boardwalk, this brewery serves its own West Coast-style brews along with cocktails and chef-inspired fare. When you’re looking for delicious craft beer and some time outside, you’ll find it in Plano. Yes, you read that right. Not only is it possible to swim across the entire state of Texas, but it’s also one of the coolest things you can do in Plano. 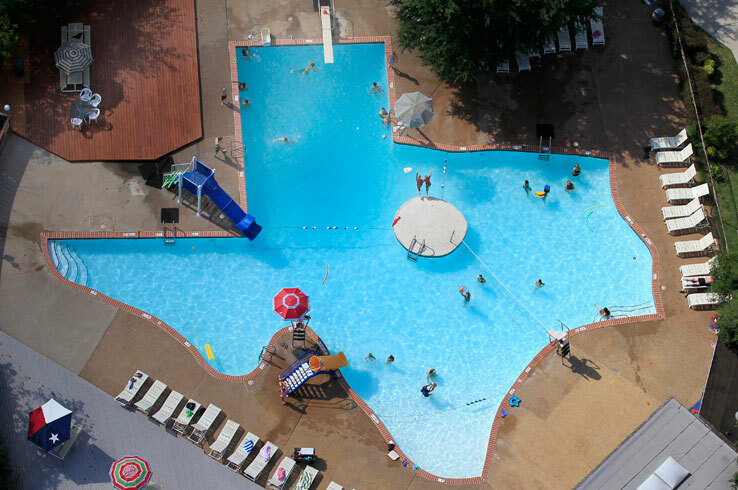 Jump on into the Texas Pool, a massive 168,000 saltwater pool shaped like the Lone Star State. Open since the early 1960’s, this historic spot is the perfect place to beat the heat. Hop off the diving board, ride on two water slides, and take a break on the small island situated. Then work on your tan on the side of the pool, cook up some lunch on the barbecue grills, or get something from the snack bar. The Texas Pool has everything you need on a hot summer day, so grab your sunscreen and get ready to swim across the Lone Star State. Big, colorful, and perfectly Instagrammable. These qualities define all the public art in Plano, and all you need to do to see them for yourself is to wander around town. 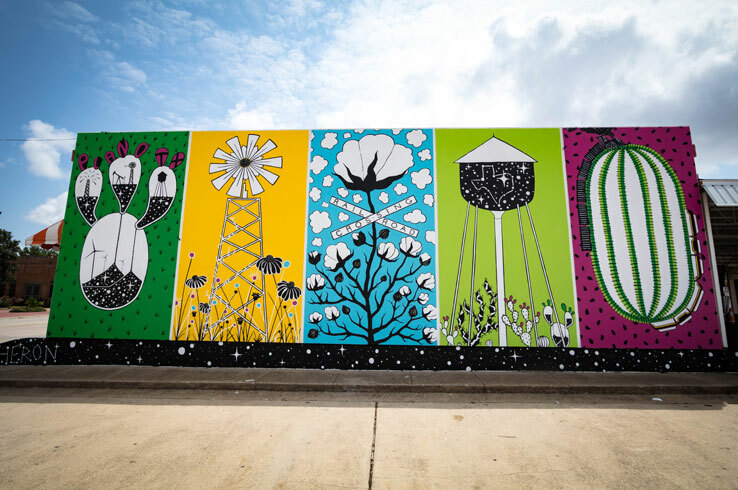 Go on a walking tour of the Historic Downtown Plano Arts District to see the murals on the side of Georgia’s Farmers’ Market and the historic streetscape splashed on the wall of Vickery Park. Check out even more art, including murals painted by international artist Adrian Torres, at Legacy Central. There are sculptures and other works throughout town, so keep your eyes open as you explore so you don’t miss a thing. 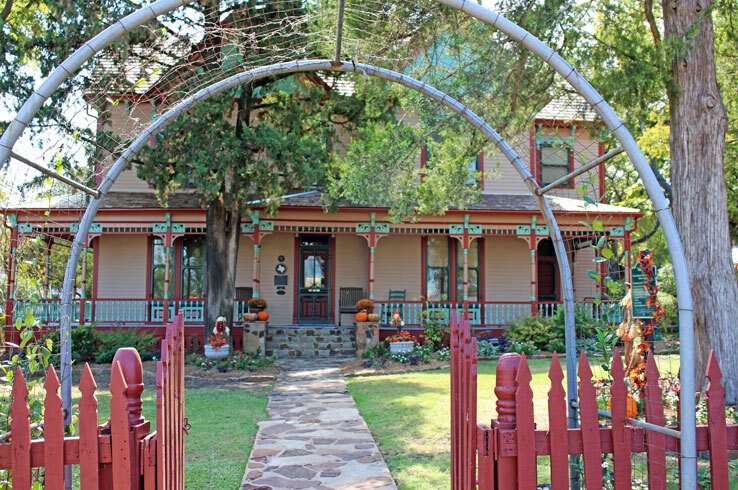 Take a step back in time at the Heritage Farmstead Museum, a working farm and living history site where you can experience life on the Texas Blackland Prairie in the 19th century. Discover North Texas history, and meet a few animals along the way, as you admire the original outbuildings and a replica of a one-room schoolhouse that still stands in Ponder, Texas. Explore the rest of the farm to discover farming culture and history from the late 19th and 20th centuries. The farm is open throughout the year, but you won’t want to miss its special events that range from seasonal festivals to learning opportunities for youngsters. Located just north of Dallas, Plano isn’t the kind of place you’d immediately think of when you’re looking to enjoy the simple pleasures of being outside. Yet its outdoor patios and stages, nature trails, and other attractions make it a fine escape to nature in the heart of the city. Plan your visit here.